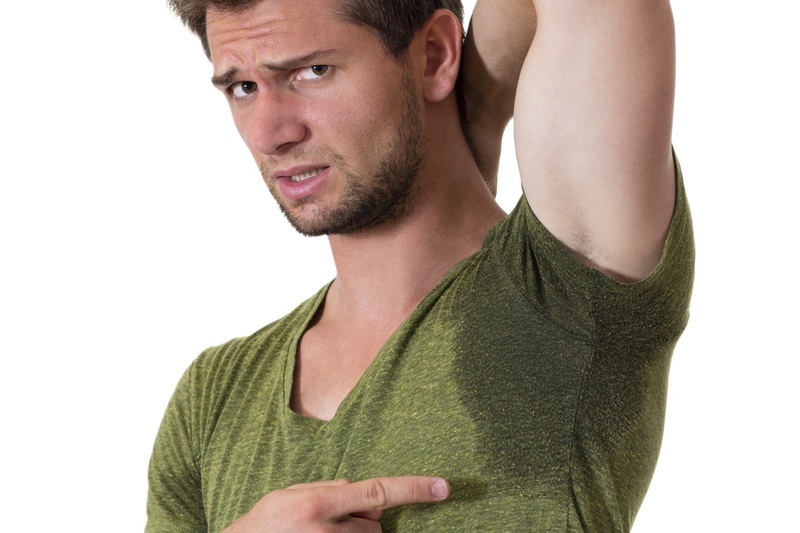 For most people, a little sweat and body odor is just part of everyday life. Whether you’re working hard, exercising, or feeling a little bit hot, you may start sweating. Additionally, there are some people that sweat when they are stressed, nervous or anxious. To handle all the different kinds of sweat your body has 2 different types of glands that create perspiration. Both of them produce an odorless sweat. This raises the question--what causes body odor? In your groin and your armpits sweat combines with bacteria that are found on your skin because of the enclosed nature of these parts. When the perspiration combines with these bacteria, an odor is produced. This is not a cause for concern, but unusual changes in the amount or odor may be. If you experience a change in body odor or sweat production, it could be a medical concern. Generally speaking, normal body odor and sweat can be effectively managed with lifestyle changes or home remedies. The term body odor applies to any unpleasant odor that the body produces. The smell varies from person to person based on a wide variety of different key elements. Your skin and sweat work together to produce the odors your body emits. When you understand what causes body odor, you may be better able to reduce or even prevent this unpleasantness. Bacteria is definitely the first answer to what causes body odor. By its own nature sweat is odorless. When the bacteria that naturally cover your body start to break down your sweat, the odor is produced. The 2 types of glands that secrete perspiration are eccrine and apocrine glands. The eccrine produces the sweat that is primarily made of water and secreted when you are exercising or working. Apocrine glands are found in specific places such as the armpit or groin and are dormant until a person goes through puberty. What we eat plays a significant role in the smell of our breath, feet and body odor in general. The different compounds and nutrients in food are essential for sustaining the body. Some of these will contribute to the way you smell, especially if you eat a sizable amount. Odors from organic compounds like sulfides get released when food breaks down. Garlic and onions, as well as red meat, egg yolks, seafood, beans, yogurt, cabbage, asparagus and some spices such as coriander can be culprits. There are several drugs on the market that can cause sweating. Some of the more common drugs that cause sweating are classified as antipsychotics and antidepressants. Also when acetaminophen and aspirin are overused, an increase in sweating is generally a matter of course. Menopause is the most commonly cited hormonal change that causes more sweating. Hot flashes are a known side effect of these changes and will cause more sweat. With the increased perspiration comes more odor as bacteria break down all the additional sweat. It may seem strange to consider, but a person’s heritage and genetics play a role in their body odor as well. For instance, those that come from East Asia have less apocrine sweat glands. This makes them less prone to body odor because of lowered perspiration which reduces the chance for bacteria to break down sweat and release acids. Additionally, East Asians have ear wax that is dryer, while others have a wetter ear wax which can produce body odor. Chemically speaking, you can have different sweat. Stress sweat just happens to be one of the smelliest types of sweat. Apocrine glands are responsible for stress sweat and their perspiration is stickier and smellier. Bacteria eat this protein and fat rich sweat faster to produce more stench. You’ll have more than just a headache in the day after heavy drinking. Your sweat glands will perspire some booze. You will also have alcohol in your breath contributing to the smell. If you’re not bathing regularly or washing your clothing often you will find strong odors present. If there are poor bathroom habits, there may also be a body odor present. This also goes for proper dental habits. Yeast overgrowth can occur on feet due to accumulated sweat. Synthetic socks can increase the problem therefore causing severer odor and even the ‘locker room effect.’ Since your little tootsies are locked up in a warm, dark and moist environment, they’ll nurture bacteria-especially if you go sockless. At the most time, body odor is harmless, but it can indicate some underlying diseases. There are many different conditions that can be responsible for body odor. including cancer of the cervix, kidney and liver problems, mouth or stomach tumors, periodontal disease and teeth problems, thyroid troubles and ketoacidosis. Liver disease: When a person can’t shake bad breath or body odor despite efforts, it may be a sign of potential liver issues. One symptom of liver disease is excessive sweating. If the body produces a rotten egg smell, it can be a sign of liver disease. Bad breath: Another sign of possible illness is bad breath. This can indicate periodontal disease. Bad breath is a large contributor to body odor and can be caused by the huge amount of bacteria that lives in the mouth. Ketoacidosis: This is a disease that hits diabetics, when they don’t take proper care of their sugars. This can give them breath that is fruity as well as a body odor that is pungent. Hyperthyroidism: When the thyroid gland isn’t functioning correctly a person may sweat a lot more and therefore have heavier odor. Trimethylaminuria: Trimethylaminuria is a condition that is caused when a specific gene mutates. This renders the body incapable of breaking down the compound trimethylamine. This chemical is what produces the fish smell in fish. People with this condition experience a buildup of this compound and therefore fishy smelling urine, breath or sweat. Urinary tract infections: These common and uncomfortable issues can cause a slightly sweet or strong ammonia smell. In extreme cases the ammonia smell may start to come out of pores as well. Warning: If you believe that your sweat is more excessive than other people’s perspiration or if you feel that your body odor or sweating has become different, it may be wise to seek your physician’s advice because these changes can sometimes indicate trouble.